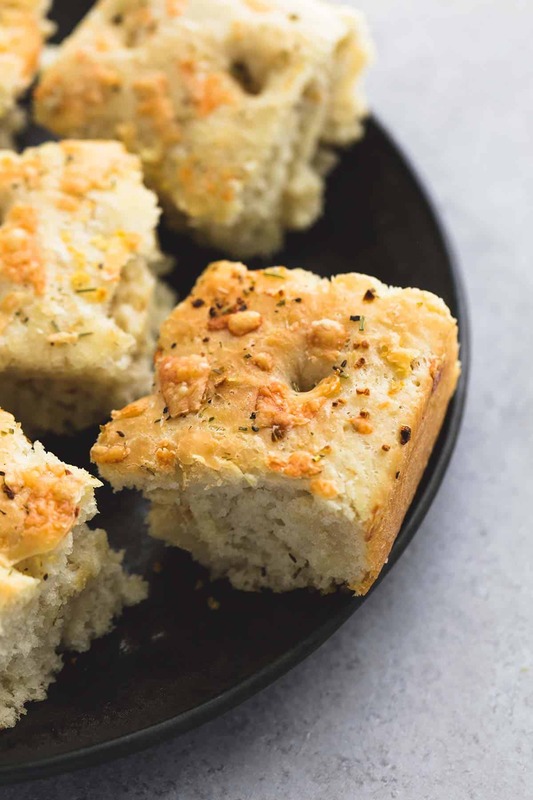 Warm and soft Easy Focaccia Bread with herb and parmesan topping is a breeze to make, has perfect texture and flavor, and pairs well with all almost any meal. I used to be scared of yeast. I can’t tell you why exactly, because my mother used yeast ALL the time and swore it was a cinch to work with but when I got hitched and started cooking and baking on the regular, I avoided yeast for awhile. But there came a day when I was really craving some freshly baked breadsticks to go with our pasta and I just had to put on my big girl pants and do it. And then I realized I never needed big girl pants to use yeast, because it’s easy. And SO worth it. There’s a pizza place my husband’s family introduced me to that serves focaccia bread with their pizza and it’s pretty much incredible. The only problem is that pizza place is a good 45 minutes north of us and we aren’t always in the mood to drive for an hour to get our focaccia bread fix. 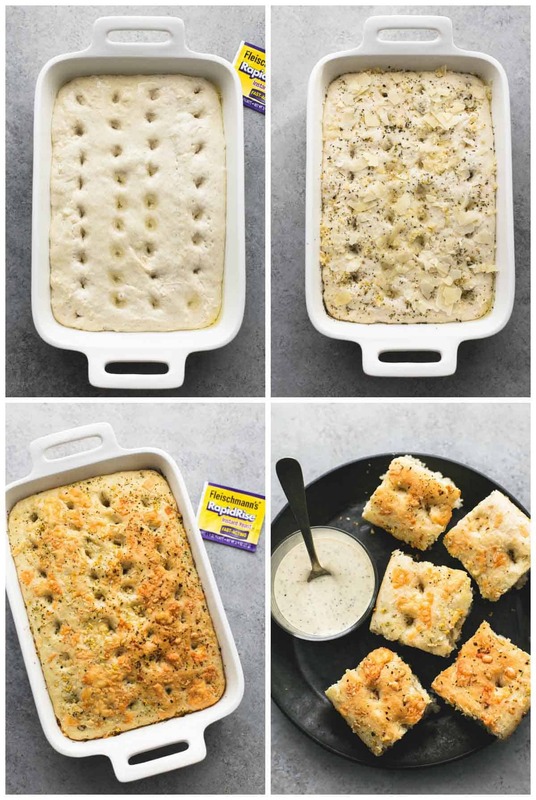 Fleischmann’s® RapidRise™ Yeast cuts out kneading and a ton of that extra rising time you’d normally have for a recipe like this and the result is absolutely perfect, fluffy focaccia bread, ready for devouring. We especially love dipping it in balsamic or ranch dressing along side our favorite meals. 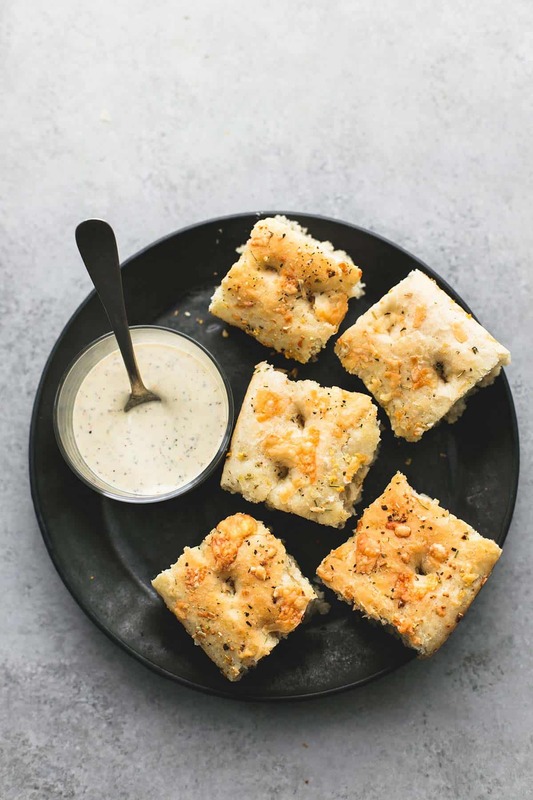 You have to try this easy focaccia bread. The best part is you can stay warm and cozy in your own home, and bake a little extra for the family. Your mid-week dinner routine will thank you! Mix flour, yeast, sugar and salt in a large bowl. Add 2 tablespoons olive oil and water, stirring until well mixed. Spread dough into greased 13x9-inch pan. Cover and let rise until doubled, about 30 minutes. Using the handle of a wooden spoon, push multiple holes into the dough. Drizzle 2 tablespoons of olive oil over dough; sprinkle with garlic, parmesan cheese and Italian herb seasoning. Cover and let rise additional 15 minutes while oven preheats to 375°F. Bake 30 to 35 minutes until lightly browned. Cool slightly and cut into slices or squares. Serve alone or with ranch or balsamic dressing for dipping. 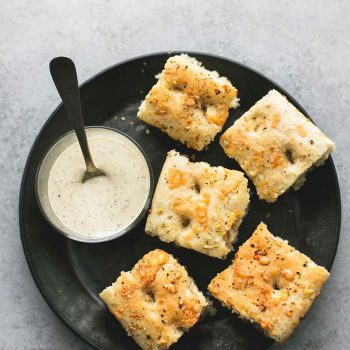 Try these other Bread Recipes you'll love! Thank you for this idea that requires only 30 minutes time ! This looks delicious. I just so happen to have regular active dry yeast at home. Could I sub that in this recipe, mixing it with the warm water before adding it to the dry ingredients? Thanks! I’m so glad you liked this Mandie! And good to hear if I run out of parmesan I should still be whipping up a batch of this tasty bread! Thank you for the focaccia bread recipe. I make it 2-3 times a month and my family loves it! We dip it in olive oil, slice horizontally and make sandwiches, or just nibble on it. so Good!!! I’m so happy that you love it that much, Dianne!! My family still begs for me to make this on the regular! Has anyone successfully halved this recipe and baked it in…maybe…an 8×8 glass dish?